Let me apologize in advance for any typos. My real computer is currently installing the latest Windows 10 update (1803) and I'm typing on a tablet - I hate typing on tablets, there is no haptics to the keyboard, no boarder to one key's end. Anyway. I have access to Netflix but I rarely ever use it. Two shows I occasionally watch there are Prison Break and Ray Donovan. But I haven't watched a Donavan episode in a few months now. It just fell off my radar. Luckily Netflix remembers where I was. Because Ray Donovan is no longer available on Netflix. I checked and it was removed back in December 2017. I use Netflix quite a bit but generally for films. When it comes to TV, I use it to trial the first few episodes to see if I want to buy it for that very reason. I actually did away with Sky TV @ £90 per month and no longer pay the TV license we have here in the UK for live TV. Instead, I now have Netflix and Prime @ £15 a month total and watch these shiny discs we all love instead. (btw, on a semi-related note, I don't use UV copies but I have redeemed them. I see many are now no longer available for some reason). If you buy UV (or redeem), that is supposed to be lifetime ownership of the Digital Rights, no? Am I misplacing my trust in those guys? Are they disappearing from your UV "vault"? I may be one of the rare ones, but I have never watched anything on Hulu or Netflix. Nor have I ever redeemed a Digital Copy. Nor have I ever uploaded anything up to a Cloud. The only mobile device I have is my smartphone and I certainly am not going to watch a movie on a tiny screen. Besides I am not sure it even has enough memory built in to handle that. I watch my UV digital copies on 4K Amazon Fire TV, 4K LG UHD TV and on 4K Xbox 1 S, using the VUDU app. Over time, the quality has been improving. Now most HD audio formats are supported. When watching on my 4K projector, I am usually not aware of the streaming vs. actual 4k disc - until the inevitable network glitch (also becoming less frequent). Hmm, I just checked for the first time in a few weeks. For about a month several titles (all Lions Gate) were showing unavailable on Flixster (which is still supported in UK). However, they now seem to be showing again. But in case you didn't know, apps such as Flixster and VUDU do not always support all titles, and may not reflect all the UV rights that you own. If you haven't done so already, set up an account here . I don't know about the other types of digital codes and how they are managed. I'm so glad you caught my attention. When I signed in to my UV account, I discovered a couple of new viewing apps: FandangoNow and FIOS, and linked them all to my UV library. And I found that my LG TV and the Xbox 1 also have a FandangoNow app. That's great, because the more competition, the faster the apps will evolve to support new audio formats and full 4K UHD. VUDU is pretty good, but I have yet to test the other ones. But yeah, I won't sell my Star Trek DVDs and BDs just because the series are all available on Netflix, now. I hate typing on tablets, there is no haptics to the keyboard, no boarder to one key's end. You are aware that you can simply plug in a USB-keyboard? USB-to-USB-Mini adapter and off you go. But that sort-of defeats the purpose of a padd, does it not? Personally, as long as they are available, I will keep my good old-fashioned midi tower PC with two 28" screens, a proper keyboard and a proper mouse. It is set up in a way that I can watch stuff from the bed and the 28" is sufficiently large enough to enjoy the viewing experience. 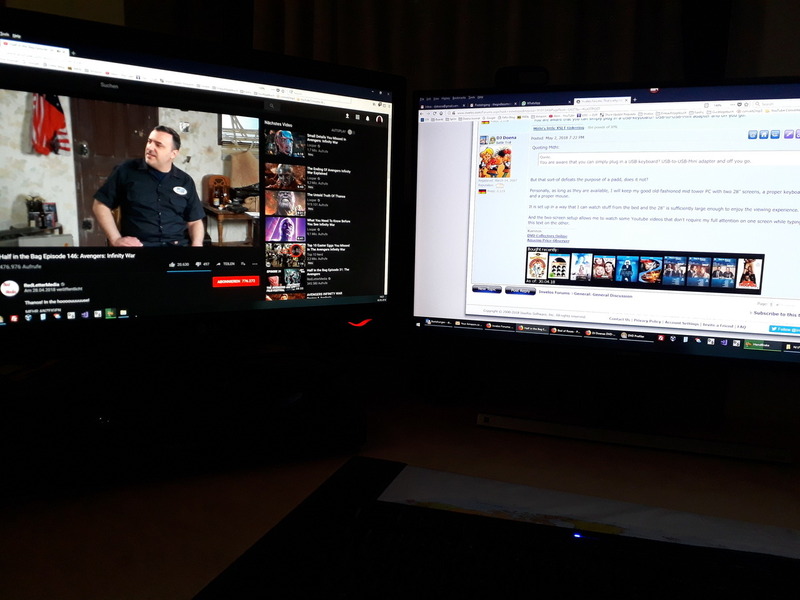 And the two-screen setup allows me to watch some Youtube videos that don't require my full attention on one screen while typing this text on the other. Nice setup. Nothing beats a PC as an all around media workhorse. Wireless BT mouse and keyboards are compatible with both tablets and PCs. Same one can pair with either. You're not alone. I've never streamed either, have no interest in it. With a library of 1100+ DVDs/BDs, I have practically everything I've ever wanted, anything else I'll pick up as the opportunity presents itself. I don't have a smartphone, tablet only, can't conceive of trying to watch a movie on the tablet (let alone a smartphone) after watching everything on a 53" WS HDTV. I know that I can stream to the TV, just don't want to. I have always come to the conclusion with streaming is that when it comes to the end of the world and we have no internet in our bunkers how are we to watch out movies luckily we have out blu-rays and dvds . I also agree. I just watched Valerian (I didn't like it so much) on a 4K UHD disc. Sound was awesome and video - well goes without saying. The disc was played from my Xbox 1S. After it was over, I immediately switched to the VUDU app and started the UV version. Even after time for the network buffers to fill up, it was clear that the data rate was nowhere near that of the disc. If I hadn't just experienced the real thing, it would have been OK, but by comparison, the disc is still king by a wide margin. I will fight my laziness in the future and try to refrain from direct purchases of the UV, without having the physical disc as well. Add another to the camp who doesn't do streaming nor redeem my digital copies and rely on physical media. Beyond the data rate, I just have a distrust of having my media on a hard drive (be it my own or elsewhere). Just not my thing, but I get the convenience. I'm a bit of a late adopter of digital copies. Don't get me wrong, I will always buy hard copies because I refuse to rely on virtual copies that are way too easy to lose rights for or a company decides, hey, we need to make more money so let's stop carrying it and then charge them again for the same movie! But...as a Vudu user, I appreciate the access when I'm not at home or just being too lazy to get up and put something on. I also belong to a Vudu group with 5 other people and have access to their movies (and they to mine except for Disney films). I'm doing a movie challenge right now where I'm watching films that I don't own from Vudu and literally have hundreds to chose from. (Unfortunately, I think Vudu has stopped doing the group thing, but those already in one are grandfathered in). I totally agree DC's aren't the best quality, but they're not bad. I feel digital copies are similar to ebooks: I won't rely on them, but it's sure is a lot easier to travel or go through long wait times with them on my tablet/phone! E-books can be freed from their protection and stored on local media. This makes them way more stable than digital video rights. I won't ever think of purchasing any media, which I can not backup on my own systems. I stopped buying BD after AnyDVD stopped their service for this reason, too.